Mt. Nasu (那須岳) is an active volcano located in Northern Tochigi Prefecture. Mt. Nasu is one of 100 best mountains in Japan. Mt. Nasu consists with 5 summits of mountains. The trekking takes about 5 hours and it is very easy for all people. 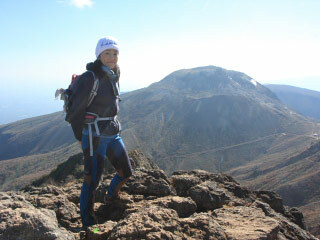 Therefore, it is very popular mountain in Northern Kanto. Ropeway:Round Trip 1,130 Yen fro Adult, and 570 for kids. There is a group discount. Winter: 9:00 to 16:00. Summer 8:00 to 16:30. 0. at Kuroiso Station or Nasushiobara Station. Trekking of Mt. Nasu is one of the very popular hiking in Kanto region. Mt. Nasu is the name of Mt. Chausu, Mt. Asahi, Mt. Sambonyari, Mt. Minamigassan and Mt. Kuroya. There is a ropeway to approach to the middle of the mountain. So, the trekking is very easy for all people. It has a great Koyo in early October.